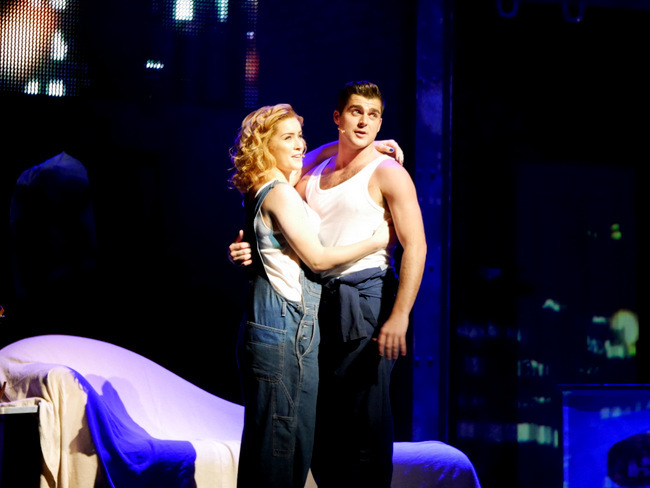 Ghost The Musical opens in Singapore at the Mastercard Theatres at Marina Bay Sands with Liam Doyle and Lucie Jones as Sam Wheat and Molly Jensen. Ghost The Musical finally opens at the Mastercard Theatres at Marina Bay Sands to a packed house! I have been all hyped up since my interview with the two main leads back in September, and was more than ready to see the new Sam and Molly take the stage. Played by Liam Doyle and Lucie Jones (replacing Andrea Laxton), the musical has taken the iconic 90s romance flick to whole new heights. Sam (Liam Doyle) serenades to Molly (Lucie Jensen) hilariously as they settle into their new apartment. Let’s just start off with how amazing Liam Doyle is as Sam Wheat. No, he is not a copy of Patrick Swayze. He brought out his own Sam, and he definitely owned it. Coupled with his impressive vocals, proven by his role as Fiyero in Wicked, he brought a new version of Sam Wheat to the stage – one I could relate to and empathize with more. Perhaps it was because I watched the original when I was a wee child (so appropriate, right?) and was unable to understand the themes running in the movie. Still, I felt more in tune with Liam’s Sam. That energy, passion and pure love he had for Molly, I felt it even though he was “invisible” to the rest of the cast. Things get heated up between Molly (Lucie Jones) and Sam (Liam Doyle). Which goes back to that heck of a chemistry the cast had with each other. Despite not being always in the same scene (in a way where Sam was invisible), you could still observe the fluidity between them. It was just as if you were watching the movie and the camera was panning across the Sam, Molly and Carl Brunner (their best friend, played by David Roberts). Carl (David Roberts) gets cheeky in the lift, cracking Sam (Liam Doyle) up. X Factor 2009 finalist, Lucie Jones takes over Andrea Laxton as Molly Jensen, and we got to hear the reason she made it so far in the reality competition. Her solo, a melodious ballad titled “With You”, which she sings as she fails to come to terms with Sam’s passing had me welling up inside. It is a beautiful song, completed by her stunning vocals. I would pay to have that on the radio. Which, coming back to that. Radio? The musical did an amazing job jumping into the 2010s with jokes on their Coca-cola-esque fridge and Sam’s jest at Carl’s Honda, but they kept one thing – the radio. I had no complains. It signified the most pivotal nostalgic moment to those who have watched the original movie. a.k.a. the pottery scene. They are not doing it for the sake making it modern, they put thought into what stays and goes where. I applaud them for that! Sam (Liam Doyle) is confronted by Molly (Lucie Jones). And, of course, you cannot leave out the song that made the movie; Unchained Melody by Righteous Brothers. 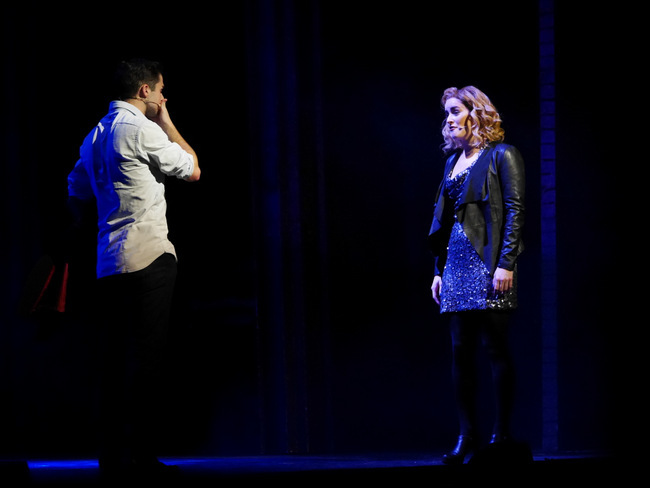 It was split into little bits throughout the musical, showing the progression of Sam’s character as finally saves Molly and himself. Never would I have imagined that an angsty version of the song would be my favourite. 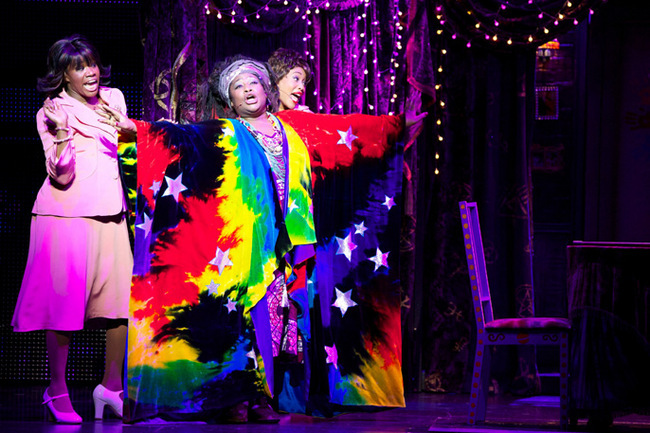 Wendy Mae Brown plays Oda Mae Brown in the Asia tour of Ghost The Musical. As we move on to the music, one of my favourites has got to be Oda Mae Brown’s. Wendy Mae Brown took Woophi Goldberg’s hilarious character and took it to a whole new level! She had me at stitches with her antics and “keeping it real” attitude. Oh, how glad I was when Bruce Joel Rubin (writer for both movie and musical), kept the same lines. Remember the scene where she reluctantly endorses the laundered money to the nun? Word for word, action for the action. All the moments that made us fall in love with this lovable character, they kept. Add on those energetic musical numbers and we have a winner. 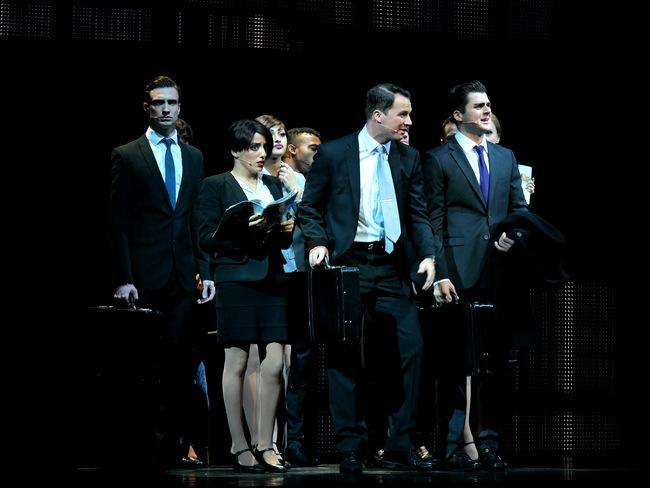 I can go on and on about each member of the cast as they have rightfully earned their spotlight on the stage. David Roberts’ Carl performed an amazing one-man show fighting with the voice of Liam’s Sam and Steve Hutchinson channeled his previous CATS incarnation for a rocking rap number as he bounced all over the stage! Oh yes, lets not forget the stage. Really, the show would have fell flat if not for the high-tech screens and swift transitions. Many times during Act I did I find myself going “Where did that come from!?”. I have got to give it to Paul Kieve (Illusionist, also worked on Harry Potter) for his ingenuity in bringing special effects to a live stage – something I did not expect to be pulled off so brilliantly. Like the one scene with Sam moving through a door? That was amazing! You got to see it to believe it. 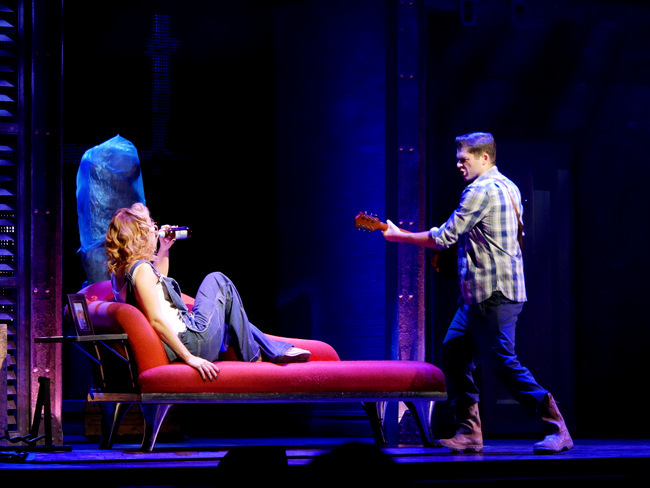 Ghost The Musical is the first English musical production that have really wowed me with its crazy use of technology. There were moments where, say, a table got caught in something and was in danger of tipping over. But, David Roberts owned it. With some help of the staff who tried to stay out of the public eye (sorry, I could still see you at the side), he continued his act as if nothing happened. Applaud that! There is so much to say! I have so many moments I adored from the musical production, mostly thanks to my growing obsession with Liam Doyle and Wendy’s side-splitting Oda Mae. It fit the hyped that Liam and Andrea built up, for sure. It really does not matter if you had watched the movie or whether you were not a fan of it (I wasn’t). I enjoyed it, and judging from the applause tonight, so did everyone else! 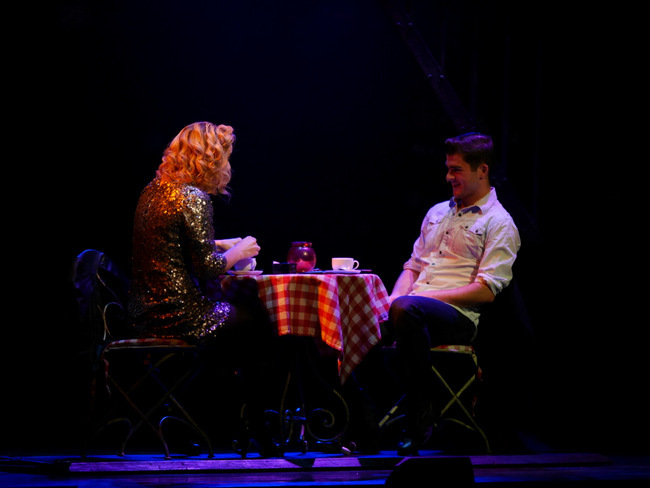 Learn more about the musical from Liam Doyle and Andrea Laxton during their interview, or find out more at their Official Website. Tickets range from S$85 (D Reserve) to S$175 (VIP Reserve), and are on sale at MBS or Sistic.